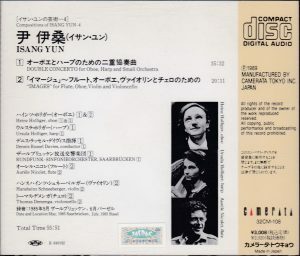 The Japanese label Camerata did great service to the admirer of Yun’s music when they issued, between 1987 and 1997, an 11-volume survey of his music, a series called “Compositions of Isang Yun” (the last volume wasn’t numbered as part of the series and was only titled “Last works of Isang Yun”), and this is how I have them. 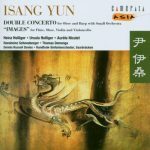 In the early 2000s the reissued their Yun collection on a 9-CD series titled “The Art of Isang Yun”, and did some reshuffling on the occasion. In the original series, the pairings were rarely entirely consistent, mixing orchestral and chamber, and various performers. The reissued series is genre-centered, with three volumes of orchestral, two volumes of concertos, and the remainer of chamber and instrumental music. Also, stacking the contents of the original eleven CDs on only nine, each offers more generous timings, almost always over 70 minutes, while those of the original series ran to about 60-minutes each. The present issue, 32CM-108, is part of that original batch, volume 4 (although the series wasn’t published, at least on CD, in its numbering order, volumes 5, with the Concerto for Violoncello and Sonata for Oboe, Harp and Viola, and vol. 6 with Symphony No. 1 and Loyang for Chamber Ensemble coming out first in 1987, followed by volume 1 with selected works for clarinet and volume 2 with the Violin Concerto No. 1, being released only in 1988). This volume 4 came out in 1989. In the original series, the pairings were rarely entirely consistent, mixing orchestral and chamber, and various performers (although, here, oboist Heinz Holliger is clearly the anchor), where the reissues are genre-centered: three volumes of orchestral, two volumes of concertos, and the remainer of chamber and instrumental music. 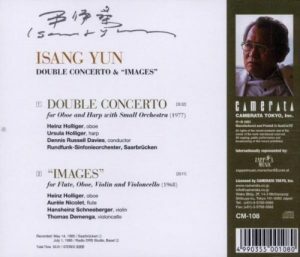 The Concerto was reissued on Art of Isang Yun-5, Camerata CMCD-50028 (with the Concerto for Clarinet and the Concerto for Cello), and Images on Art-8 (Chamber Music III), CMCD 50031, with other chamber music compositions, including the Sonata for Oboe, Harp and Viola also featuring Heinz Holliger and his wife harpist Ursula Holliger. The reissues, stacking as they do the contents of the original eleven CDs on only nine, are also individually more generous (circa 75 minutes), although, at 56 minutes, this one gives no cause for complaint. 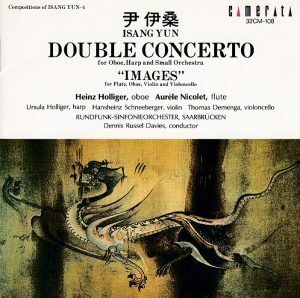 In the Double Concerto for oboe and harp, written in 1977 for and performed here (in 1985) by the two Holligers, the music can have its thorny moments and orchestral outbursts, some decidedly contemporary “ugly” vibrating sounds on the oboe (circa 12:50), and the construction is very free and episodic, but it has an extraordinary refinement, color and evocativeness in the dialogues of oboe and harp between each other and with various instruments of the orchestra. There is an underlying story – the legend of the love of the harp-playing princess and the shawm-playing cowherd, thwarted by the cruel king who bans them both at each end of the Galaxy, with only the right to reunite once a year, on July 7th – for Yun, a symbol also of the division of Korea. Images for flute, oboe, violin and cello is a relatively early composition (1968) but it is already all there. A South-Korean established in Berlin and a political opponent (South Korea was back then a dictatorial regime) actively advocating the reunification of both Koreas, Yun was kidnapped in Berlin by the South Korean secret police, taken to Seoul, tortured, condemned for espionage and sentenced to life imprisonment. In the face of the international protestation the Korean Government released and exiled him, and Yun never returned to Korea. Along with his piece for clarinet and piano Riul, Yun composed Images while still in prison, when he was allowed to compose again. The liner notes develop to a great extent the inspiration and images underlying the composition, and surmise that the four instruments symbolize and portray the four protecting gods – turtle, dragon (if a dragon is a oboe, then it must be the dragonet of Mulan! ), Phoenix-bird and tiger – whose frescoes often adorned the four walls of the burial chambers of ancient Korea, Well, anything goes. What matters is that Images is again a music of extraordinary refinement and invention in color, and it is certainly not by coincidence that Yun chose three out of four “soprano” instruments: he has them mysteriously dancing in the upper registers like the calls of some Korean female spirits – benign or evil, the question remains open – with fascinating, high-pitched melismata that I can only describe as meowing or cuckooing, and sometimes whining. If they are gods, as the dragonet in Mulan they sure are garrulous! The four instruments’ intricately interlacing lines become increasingly agitated as the first movement develops, and in the second part – regrettably not cued, it starts at 10:54 – the music becomes wildly agitated and aggressive for a few minutes, with four seemingly independent melodic lines jaggedly shouting and vying for prominence. But somehow it all blends into a convincing whole, and the music never looses its refinement, until it returns, at 13:59, to the slightly more appeased, but still enigmatically shouting atmosphere of the beginning. The unique voice of Isang Yun must not be forgotten.